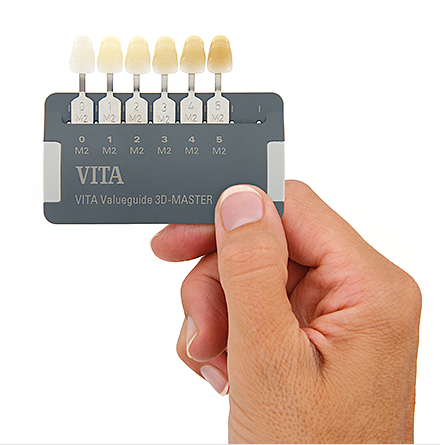 Tips for performing shade determination when working with a VITA shade guide. – By practitioners for practitioners. Performance based on a reliable system. Establishing and maintaining esthetic and healthy teeth – that is always the focus of individual consultations, examinations and treatments. The tooth shade provides the finishing touch in superior quality services of this kind, and is the mark of quality that is always visible. Natural reproduction in this respect is a daily challenge. After all, natural tooth shades differ in terms of lightness, hue and chroma. And depending on the individual interplay of these factors, this has an impact on the entire restoration process. So it is good to have a partner at your side who offers efficient, proven support. It's good to have VITA at your side.